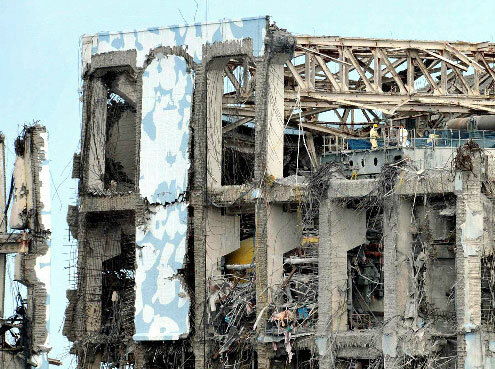 Fukushima Daiichi Reactor building 4 with its exposed fuel pool. Chris Canine – who has 15 years experience as a health physics technician, chemist and radiation safety instructor – told Energy News that if number 4 reactor fuel pool at Fukushima collapses, Japan will be evacuated. He did not elaborate on how such a logistical nightmare would be accomplished. Canine worked at Fukushima in the late 1970s and has also worked at over twenty nuclear plants in the United States, Japan and Mexico. There are several reasons why I believe the country will be evacuated if the #4 SFP collapses. The amount of radioactive material in the fuel pool dwarfs the total amount at Chernobyl by a factor of 5 to 10. Chernobyl’s core was still mostly contained in a building (although heavily damaged), and most of the radioactive material melted downward and became lava like. If #4 SFP collapses it will be lying on the completely open ground, probably going critical on and off in portions of the pile for years. The dose rate from this pile will make dropping sand or anything from the air much more lethal than anything at Chernobyl. And probably impossible. The entire site at Fukushima will be uninhabitable and unworkable because of the dose rate coming from this pile of fuel. That means there will be no control of the other fuel pools, and we could lose control of them. Nuclear experts will soft sell the ramifications because that is how the industry works. When the experts “have concerns” about the situation at #4 that means they are pooping their pants. My experience at Fukushima was 30 years ago. I worked in the industry for about 15 years as a health physics technician. I was also referred to as a “nuclear gypsy” because I traveled from plant to plant working outages. That meant I was always in the middle of the hottest jobs in the heart of the plant. The engineers will talk about this part or that part of a plant, but I have been all those places wearing full gear. In late February of this year it was reported that the Japanese government considered evacuating the country’s most populous city, Tokyo. A number of experts have called for evacuating areas of the country due to high radiation levels. Australian physician and anti-nuclear activist Dr. Helen Caldicott said in August that response by the Japanese government to the radiation danger posed by the destroyed plant has not been sufficient. “The number of people evacuated is nothing compared to the total number of people at risk in Fukushima, which has a population of around two million or so in the prefecture,” Caldicott said.